What ancient Chinese wisdom teaches today’s leaders in times of complex change. The other day I read that business leaders are obsessed with Sun Tzu’s Art of War. It made me wonder: how many leaders know Lao Zi’s short book – commonly called the Dao de Jing or simply: the Laozi (老子). It’s 2400 years old, and easily the best book I have read this summer. Are you looking for fresh insights on how to lead and deal with complex change, or just interested in ancient Chinese thinking? What words of wisdom could China’s Lao Zi (The name Lao Zi is best taken to mean Old (Lao) Master (Zi)) possibly have for you today? “Difficult and easy complete one another. High and low determine one another. But when they die they become brittle and dry. 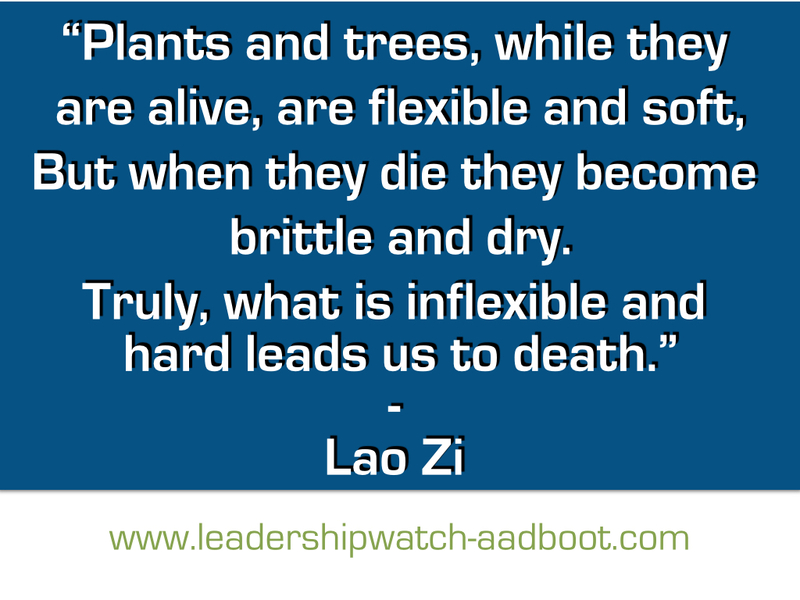 Truly, what is inflexible and hard leads us to death. “To know when one does not know is best. Be observant. Become a better listener (read a few tips here). Take the time to understand what is behind unfamiliar behavior before making up your mind and voicing your opinion. Particularly in cross-cultural business situations (read more about cross-cultural differences in teams). “To be like water, that’s the highest. “Fame or your own body: which matters to you most? Can you embrace the One? And never lose it? Can you, without consulting oracles, foretell fortune and misfortune? Do you know where to stop? Do you know where to let go? How to not put the blame on others but instead look inside yourself? Can you be a like a baby? A baby can howl all day, yet its throat never gets hoarse – harmony at its height! A baby can clench its little fists all day, yet its fingers never get cramped – so perfect is its inner strength! A baby can stare all day without once blinking its eyes – so little affected it is by things that do not matter. Lao Zi, legend has it, lived to be 160. Should you now decide to print his words and hang them on your mirror: know that I have done the same. What reflections or thoughts do you have after reading this? Let us know! Join us and register at the top of this page to stay up to date with LeadershipWatch articles and news. Your personal information will be kept strictly confidential. This article is part of our Expert Series in which Hanneke Siebelink shares valuable leadership lessons from a list of experts, researchers and role models she selected. The LaoZi is among the most loved and translated works in world literature. Arthur Waley’s translation into English (1934) is excellent. For Dutch readers we highly recommend Kristofer Schipper’s translation into Dutch (2010). Hanneke Siebelink is Research Partner and Writer at HRS Business Transformation Services, and author of several books. Her current research focuses on how leaders build successful organizations by increasing the quality and effectiveness of collaboration across companies, functions, and cultures. She is particularly interested in China and East-West relations and is learning Mandarin Chinese. Find out more about Hanneke and HRS services. If you would like to invite us to your organization, contact us here. ← Leading Complex Change Programs: Stimulate People to Think Impact!